Compared to its southern counterparts, Brisbane’s winters are mild. But even Brisbane’s mild winters feel cold when you’ve been north of the border for a few years. Besides, I had just walked two blocks from Edward Street to George Street. 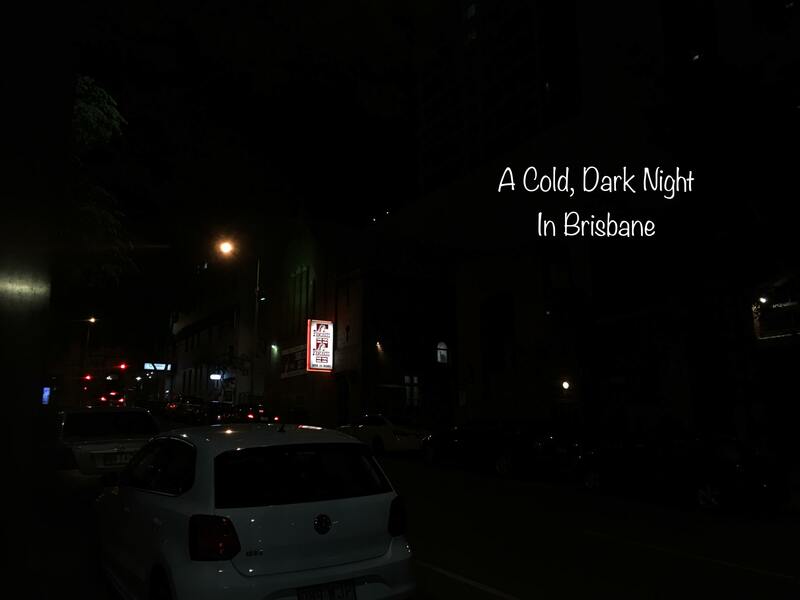 Why was I walking around Brisbane on a cold night? Because WordCamp starts tomorrow and the Welcome Drinks were at the Stock Exchange Hotel on Edward Street, and I’m staying at a Hotel on George Street – two blocks away. 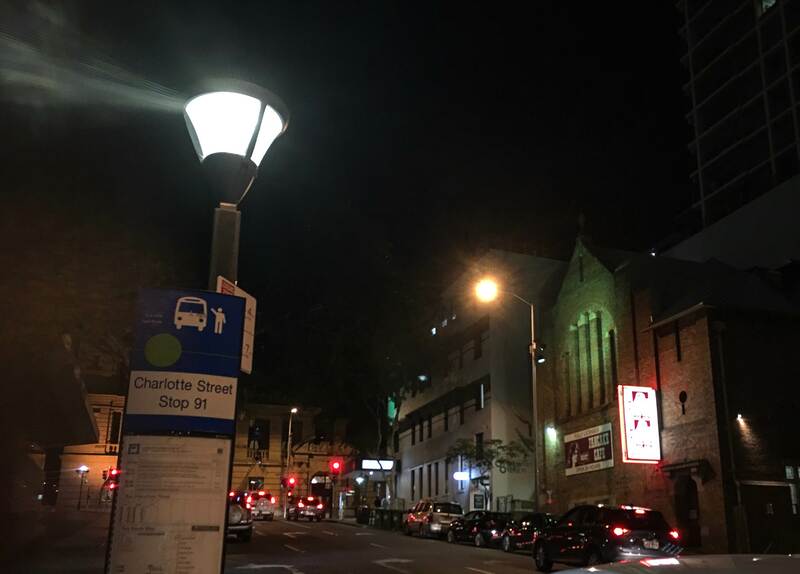 But it was on the last block, on Charlotte Street, that I realised how nice Brisbane looks at night. How did we ever manage before we had Smart Phones with great cameras built into them? And how many ‘Kodak’ moments did we miss because we didn’t have our camera with us? In an instant I was poised, iPhone in hand, ready to capture the moments of the night. An old facade, cleverly incorporated into the new. I’ve walked along this street many times, and I’ve never noticed that sign on the wall. 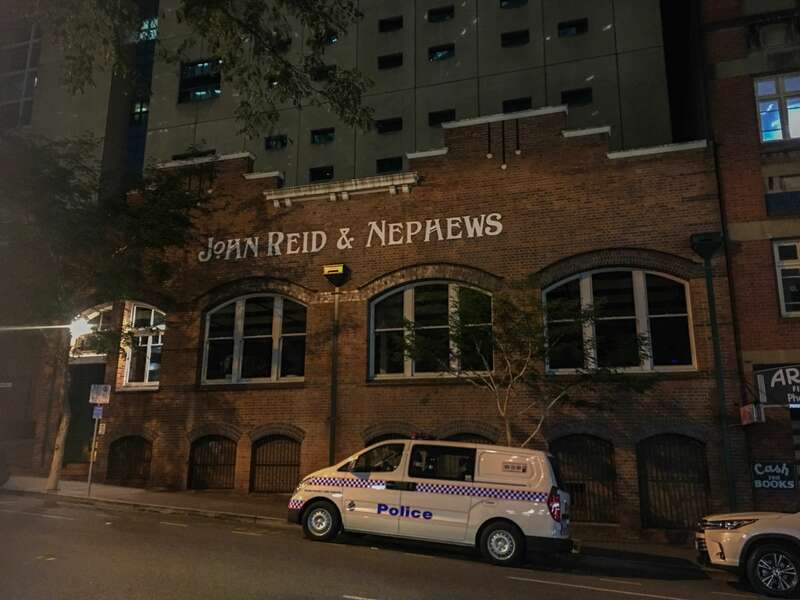 A quick bit of research has revealed that John Reid & Nephews was an engineering firm. The front of the old building is the only part that’s left, and it has been cleverly glued to the front of the new Telstra Building. Now there’s a novel use for super-glue. One of my favourite places in Charlotte Street is the Pancake Manor, which is housed in an old Anglican Church. The food is good and it’s open 24 hours a day. Great for early morning brekkies, and midnight snacks. Lights, on a dark night, draw a camera to them like a moth to a flame. 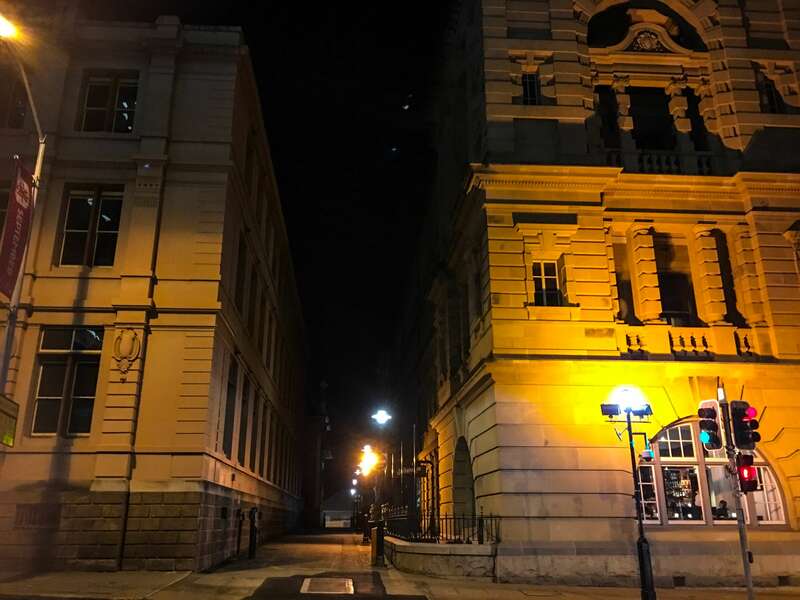 I couldn’t resist the neat line of lamps illuminating the laneway between the buildings, that I’m guessing are part of the Treasury Casino. And who could resist this? As I turned the corner into George Street, the beauty of the old buildings summoned me to go closer. The stark contrast of the old, dwarfed by the new, leaves me wondering how long these relics of the past will survive? Will our grandchildren and great grandchildren wonder what life must have been like in the old days? Will the only link be an album of aging photographs? 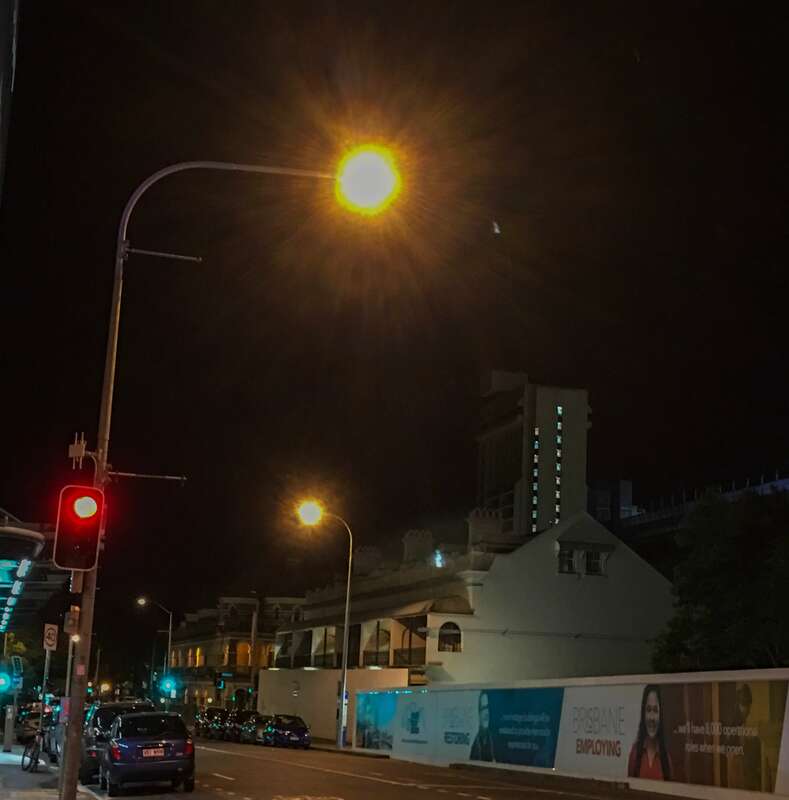 I hope not; but, I will capture as many moments as I can, on a cold dark night in Brisbane, just in case.